Yes, I'm over the heat of summer, but that doesn't mean I'm over the fruits of summer. I try to have at least watermelon or cantaloupe in the fridge at all times during summer. I LOVE watermelon and cantaloupe. I can't decide which is my favorite, it changes daily depending on the particular melon. Don't make me choose! Honeydew is OK, but it's not near as good as the other two. Sorry, honeydew. I love all melon-y things, this includes a melon themed polish by Krafty Gurl I recently purchased. Melon Mania is a mix of orange, green, and hot pink glitters in a clear base. Colors. Totally on target as far as theme. 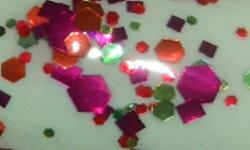 The glitters all represent cantaloupe, honeydew, and watermelon nicely. This is great mix of colors. The colors are fun, bright, and compliment each other. Formula: Formula on this was easy to use. This is definitely just a glitter topper, but I like that flexibility of that. I did two coats over the base. Price: I paid $6.50 for this on Krafty Gurl's site. Yes, you heard right..$6.50. That is very reasonable for an indie polish! Overall: Cute, fun, and bright glitter. I love the color combo and the price. No complaints! What is your favorite kind of melon? This is one I picked up from her shop and I really like it! I love it over the mint green! What an awesome combo!! Such a pretty glitter! I like the green in this glitter! Definitely suits the name :). OPI Vant to Bite My Neck?